Naturally, this tequila-induced Awfulness lead to a declaration on my part to, from here on out, subsist on nothing but vegetables and water. I could do it, too. I could walk on sharp tacks, bathe in rubbing alcohol (ugh, please don’t say alcohol), watch a horror film with my eyes open — any one of these things might feel better than the Awfulness. Vegetables and water. Detox. I’m doing it. Saturday morning, this was. So I drank some water, ate sliced cucumbers, went out for a walk. Easy. That’s when I got hungry. While Ben laughed at my inability to eat only vegetables for one day, I revised my previous declaration to state that I would only eat vegetable-based meals for an entire week. You know, as opposed to pastry-based ones. It’s been two whole days, and the declaration remains intact. I tried to bake a pound cake today and it exploded in the oven. (What? Even professionals explode cakes from time to time.) If that’s not a sign, I’ll eat my foot (covered with cucumbers, obviously). So, in honor of the Awfulness, I present to you a delicious, veggie- (fine, fruit-) based recipe. 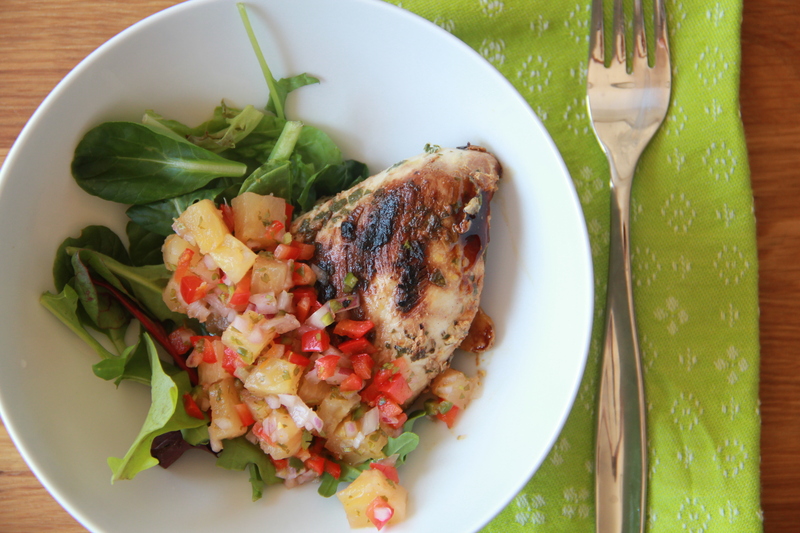 Grilled pineapple salsa. To be eaten over greens and maybe some black beans or tofu. Or chicken. Maybe turkey burgers? Pita chips. Whatever. Just, please, hold the margarita. Set a charcoal or gas grill, or an indoor grill pan, to medium heat. Place pineapple rounds down and grill 2-3 minutes per side, until lightly golden and grill-marked. Remove from heat and cool to room temperature. Once cooled, cut the pineapple into chunks, about 1/4-inch large, remembering to cut around and discard the tough cores. 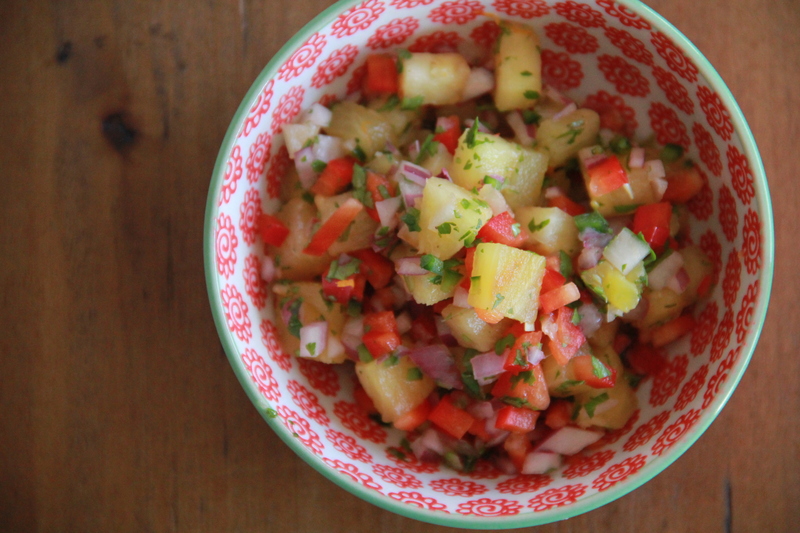 Place pineapple chunks, onion, jalapeno, and red bell peppers into a large bowl, and stir to combine. In a small jar or tupperware with a lid, combine the ginger, honey, vinegar, and citrus juices, and shake until well combined. Pour the juice mixture over the pineapple mixture, and stir until well coated. Add the cilantro and salt and pepper to taste, tossing gently to combine. Use immediately or cover and refrigerate for up to two days. Makes about 5 cups salsa.